I flew back to the United States just before Christmas, the day before Gatwick closed again. I got out just fine, but the flight I took, along with many others, was cancelled the next day. There was also chaos on the roads. If I recall correctly, the transport budget is going to be cut by 15 per cent in real terms, so things are surely going to get worse next year and the year after that and the year after that. What are a few potholes between friends? At least there was good news from the US. Last month, in a rare show of bipartisanship, the House and Senate passed a big fiscal stimulus package, including cuts in payroll taxes. Plus, the Federal Reserve is doing more quantitative easing to help get unemployment down. In Britain, the latest data release on the labour market from the Office for National Statistics showed a big jump in autumn in the number of unemployed (up 35,000) and in the unemployment rate (from 7.7 per cent to 7.9 per cent). Unemployment rose to more than 2.5 million and was only 4,000 below the high point in the recession, in February 2010. Unemployment among women was at its highest since April 1988. The number of full-time jobs fell by an astounding 58,000. Public-sector employment fell by 33,000 but private-sector employment stayed unchanged. It doesn't look like job creation in the private sector is going to make up for job destruction in the public sector. The adjacent chart suggests that the public believes that unemployment is on the rise and there are going to be fewer vacancies. It plots data from Nationwide's consumer confidence index, which asks respondents about what they think the employment situation will be six months ahead. It shows the percentage who say that there will be "not many/few jobs" available. This has risen sharply since May, when the coalition was formed. Also plotted on the chart is data from the European Commission's consumer survey, which asks respondents what they think is going to happen to unemployment over the next 12 months. It is calculated as an index and has also risen sharply since the spring. 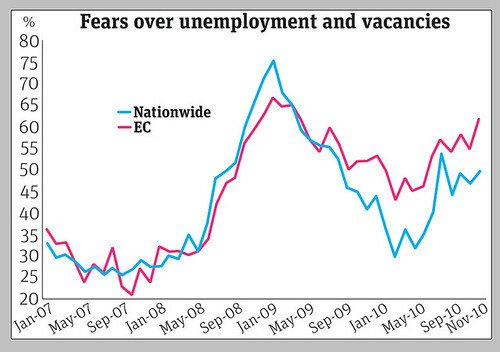 The fear of unemployment is rising. Of particular concern is how, between August and September 2010 (the most recent data available), 81 per cent of the increase in overall unemployment was accounted for by youngsters under the age of 25: it was up 19,000 among 16-to-17-year-olds and 25,000 among 18-to-24-year-olds, out of a total increase of 54,000. Youth employment (ages 16-24) actually fell by 38,000. In a paper I wrote with David Bell, published in the January 2011 edition of the National Institute Economic Review, we show that underemployment is especially prevalent among young people. Youngsters can't find jobs but when they do, these tend to be part-time rather than full-time; temporary rather than permanent; and often with fewer hours than they would like. They are also more likely than adults to be out of the labour force or inactive but to report that they want a job. Once again, there is talk of a "lost generation" as youth unemployment heads inexorably towards the million mark – it is now at 943,000. Almost half the young people not in work surveyed for the latest Prince's Trust Youth Index claim that unemployment has caused them problems, including self-harm and insomnia. The survey, funded by the Macquarie Group Foundation and carried out by YouGov between 26 and 29 November 2010, showed that about one in six young people has found unemployment as stressful as a family breakdown, while more than one in ten claims that joblessness has given him or her nightmares. The research, based on interviews with 2,170 16-to-25-year-olds, also shows how young people are twice as likely to self-harm or suffer panic attacks a year into unemployment. The charity's third annual youth index shows how those who are not in employment, education or training are less happy across all areas of their lives. More than half said that searching for work had left them feeling disillusioned or desperate. Shamefully, the government is ignoring the problem of youth joblessness. The work programme it is about to launch is doomed to fail, as there are no jobs around, even if the government wants to pretend that there are. There are five unemployed people for every vacancy. In response to a question on the increase in unemployment by the Labour leader, Ed Miliband, at Prime Minister's Questions on 15 December, David Cameron said: "While part of the figures are disappointing, they are mixed because we did see the claimant count has come down in the unemployment figures and also we are seeing an increase in the number of vacancies in our economy. Every day, there are another 10,000 vacancies. So, yes, we have got to get the private sector going, increase the number of jobs that are available." They sure do. The claimant count, which excludes many of the unemployed, including all 16-to-17-year-olds, fell by a paltry 1,200. Cameron misspoke, as vacancies are not rising by 10,000 a day. Far from it. Over the quarter, they in fact grew by only 1,000. So, assuming there are about 91 days in every quarter, the number of vacancies grew by only 11 a day, not 10,000. Anyway, this increase was driven primarily by a one-off increase in vacancies in the public sector. As is made clear in a note on page nine of the data release, the estimate for the three months to November 2010 includes vacancies for temporary jobs in connection with the 2011 census, which have been advertised by the Office for National Statistics since October 2010. Excluding these census vacancies, there were 455,000 vacancies in the three months to November 2010, down 12,000 from the three months to August 2010, or 132 a day. Private-sector vacancies fell at a rate of 55 a day. It doesn't look like the coalition government has got the private sector "going" yet. Net job creation in the private sector this quarter was zippo, zilch, nil, zero – that is, none at all. George Osborne's policies are not working.